Newcomer Family Obituaries - Emil V Constantine 1931 - 2019 - Newcomer Cremations, Funerals & Receptions. 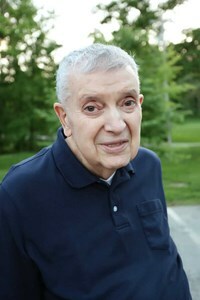 Emil V. Constantine, 87, of Centerville, Ohio, passed away peacefully on February 3, 2019 at Kettering Medical Center. He had respiratory failure following a fall with spinal fractures. He was born on September 1, 1931 in Windsor, Ontario, Canada to the late Constantine and Maria (Dopp) Constantine. He grew up in Windsor with his five siblings. The family was Romanian Orthodox but mother and children became Seventh-day Adventists impressed by the Holy Spirit while listening to the Voice of Prophecy radio program. Emil graduated high school at Kingsway College in Oshawa, Ontario, Canada where he also sang in a male quartet. He later completed an apprenticeship as an electrician in Vancouver, BC, Canada. He graduated with an Associate Degree in Industrial Technology from Andrews University while working in Plant Engineering and was a special instructor of electricity in the College of Technology. He worked as an electrician for Kettering Medical Center for a total of thirty years (founder 1964) and five years at Greeneville SDA hospital in Greeneville, TN. He was an entrepreneur and had his own electrical business, Constantine Electric, which served many local residents and businesses. On July 14, 1968 he married Joyce J. (Stafford McCormick) Constantine, an RN at Kettering Hospital where they met. They lived in Centerville, OH for the last 40+ years where they raised their three children. They were church planters and have been charter members of the Eau Claire SDA Church and Coloma SDA Church in Michigan, Kettering SDA Church and the Centerville SDA Church in Ohio. He had many interests including gardening, reading the Bible and religious books, Pathfinders, singing and adding to his various collections of coins, stamps and autographs of famous people. He also enjoyed being a ham radio operator. He was a founding member of the West Central Ohio Amateur Radio Association (WCOARA) and also a member of the Disaster Medical Assistance Team (DMAT-OH 5) for several years. These are groups of trained amateur radio operator volunteers organized to assist in public service and emergency communications. KC8HYK Emil Valer Constantine is now a "Silent Key." Although he had many hobbies, Emil’s primary love and devotion was to God and to his family. Emil is survived by his loving wife of 50+ years, Joyce; children: Eugene (Lori) Constantine, Steven (Judith) Constantine, Cheryl (Mike) Bernard; Nine grandchildren: Anita, Aaron, Benjamin, Megan, Joshua, Isaac, David, Abigail and Caleb; sister, Rae Holman; brother, Greg (Sharon) Constantine; sister-in-law, Brenda Constantine; nieces and nephews: Jack (Donna) Lungu, Tim Straman, Tom Straman, Karen (Ignacio) Holman-Cervera, Mark Constantine, Mike (Myrna) Constantine and Laura (Ron) Constantine-Coonley, Greg Constantine, Rob Constantine; as well as cousins in Romania. In addition to his parents he was preceded in death by two of his sisters and their husbands; Helen (John) Lungu , Minerva (Russell) Straman; brother, George Constantine; brother-in-law, Hans-Jorgen Holman; and nieces Lisa Lungu Heldenbrand and Kirsten Holman. To leave a message for the family online, please visit www.NewcomerDayton.com. Add your memories to the guest book of Emil Constantine. My Deepest Sympathy on the loss of Emil. Hold fondly in your heart his precious memories. Thoughts and prayers to you Joyce. The last full week end of the month starting with 1967 I spent with Emil at our church polar bear camp out. I got to know him. He was a strong man. We carried big tree logs to build a hut so we and church children could live in for the week end. Emil was a caring, passionate, patient person. Very knowledge. He loved the pathfinder organization and what it stood for. He was a true Seventh day Adventist. A reader of the Bible. I will miss you Emil. I'll see you in heaven. I was so sad to hear this. :-( I haven't seen him for many years but do keep in contact with his son Gene and his wife Lori. I am so sorry, and I know words don't help but we will see him again soon and I do believe soon. He can rest while God holds him close as his jewel, then he will awake and be whole, just like my dad. I can't wait. Love and hugs to all of you. I'm sorry about your sorrows. At least we'll see him in the morning.